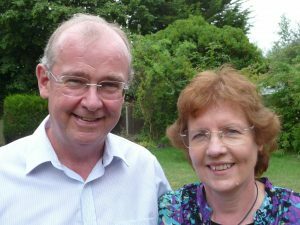 Jack and Sandra Telfer have led retreats and quiet days in various settings. They love to create a space in which others can encounter the Lord for themselves using a variety of Biblically inspired exercises which draw from a range of traditions. They are also involved in supporting cross-cultural workers and are part of the member care team of a UK based mission organisation. Their work has included debriefing and also running retreats for field workers and field based teams. They have been married for 40 years and have two adult children and two grandchildren. Grace Space – an opportunity to step aside to be with ‘the God of all grace’ – Father, Son and Holy Spirit. We will take time to reflect on God’s grace and our response in the various circumstances we face and explore how both accessing and standing in this grace is vital to our life and wellbeing in the Lord. Emmaus Road – an opportunity to come aside and be with Jesus as we each consider our journey with him. Using a selection of Bible passages and a variety of reflective exercises there will be space to stop and be for just a while – to meet him where we really are, hear his perspective and for our hearts to burn again for the continuing journey. Additionally, Jack and Sandra are available to lead Quiet Days. ARE YOU ENJOYING YOUR BIBLE? One of the best ways to enjoy your Bible is to use some form of daily Bible reading notes that not only suggest a passage for you to read each day, but also supply you with a brief comment to help you engage with the passage. Why not try NEW DAYLIGHT from the Bible Reading Fellowship (www.brf.org.uk)? I am a regular contributor to these notes and feel they have some great writers with a balance of viewpoints. If you enjoy longer times to spend with God, or like to plan your own Quiet Day, why not try QUIET SPACES, a devotional guide designed to give you material to use yourself, however you want? Also available from BRF.